On May 23, 1964, Jim Templeton, a former fireman from Carlisle in the North of England and a keen photographer, took his wife and 5 years old young daughter out to on Burgh Marsh overlooking the Solway Firth estuary eight miles west of Carlisle in Cumbria, UK, to take some photographs. They parked and walked out over the grassy expanse. There were sheep and cows grazing on the far side of the marsh, which Jim related later as being fairly unusual as normally the cattle would be scattered across the area, and a couple of old ladies knitting in a car parked at the roadside 300 to 400 yards away. The weather was warm and sunny, and everything seemed normal. At a good spot they decided to take a photograph of his daughter in her new dress sitting with a bunch of hand-picked flowers. The snap taken, they moved off and took many more pictures of the walk. Some days later Mr Templeton got his photographs processed by the chemist, who said that it was a pity that the man who had walked past had spoilt the best shot of Elizabeth holding a bunch of flowers. Jim was puzzled. There had been nobody else on the marshes nearby at the time. But sure enough, on the picture in question there was something odd: overlooking her left shoulder, at a canted angle, was what appeared to be a man in a spacesuit. This figure was either extremely tall and capable of leaning off balance quite comfortably or was floating in the air. The figure did not reappear in any of the other photographs. 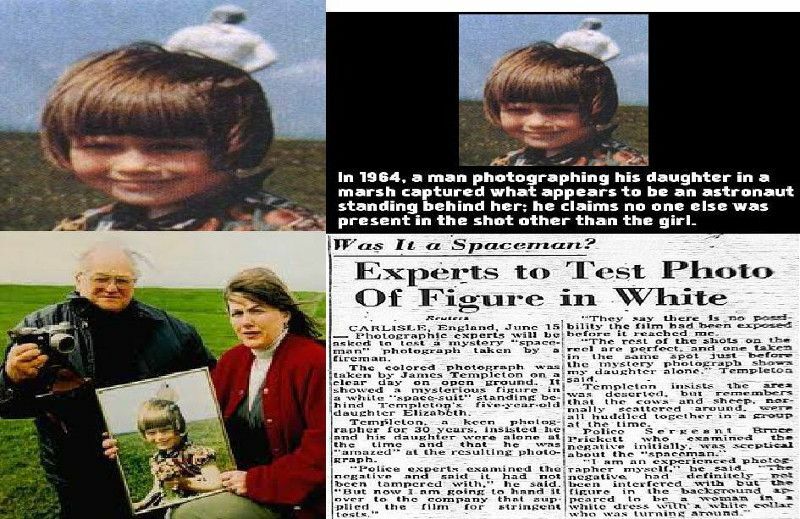 Neither Jim nor his wife nor his daughter had seen anyone near them at the time of the photograph, let alone a tall man in a spacesuit. The press heard of the intriguing photograph and published it. Reflecting on the bizarre incident, Jim told reporters he saw no UFOs at the time and in fact isn’t really interested in them, although he is aware that UFO activity in the Burgh Marsh area has apparently increased over the years. Indeed The Chapel Cross Atomic Power station lies just over the Scottish border around 15 miles North-West of Carlisle. Not long afterwards the editor of the Cumberland News newspaper contacted Jim and asked if he could borrow the negative to send a copy out to Australia. Apparently the photograph had appeared in the press there and staff working at the Woomera test range area in Southern Australia had seen it. Jim was told that the day after he took his photograph, a Blue Streak space rocket was due to be launched from Woomera in Australia. The countdown was postponed when two automatic survey camera had independently spotted two large figures in the firing area during the countdown phase. They were very similar in appearance to Jim’s mysterious visitor. At the time of the launch, the photograph had not reached Australia and the staff had no knowledge of the bizarre image. The Woomera missile test range was run by Group Captain Tom Dalton-Morgan from 1959-1963 and he came forward with his own story. Prior to the test firing of an earlier “Blue Streak” rocket, observers stationed 100 miles down range called to tell Tom that there was a “light” heading his way at incredible speed, towards restricted air space. Tom and several scientists watched as the light circled the facility, then shot away and vanished. He remarked that he “could not conceive of any plane or missile that was able to perform the maneuvers seen by my team”. He said UFOs were frequently seen in the area and that in 1964 they had aborted the launch of another test when a “white being” was seen on the automatic security cameras. During the period immediately prior to 25th May outstanding problems concerning range safety and instrumental coverage were resolved with the Range Authorities. The report also lists a long series of various technical incidents with the several subsequent Blue Streak missiles test launches. Obviously no Blue Streak was launched on May 23, 1964 or before the first launch on June 5, 1964. Jim Templeton then also discovered that Blue Streak rockets were being manufactured in the UK at Spadeadam, a location several miles away from Burgh Marsh on the Carlisle to Newcastle road. There is a letter in the Public Records Office in Kew, London uncovered by ufologist Jenny Randles which is dated 1964 December 29th referring to the Cumberland Spaceman by the Ministry of Defence (MOD). In it are references by the Department of Scientific and Technical Intelligence (DSTI) of an investigation into the matter. Another letter there dated 1964 June 15th is from a reporter enquiring about the aborted launch and the film in question which shows an extraordinary object hovering nearby that is ‘impossible to miss’. A response to this letter from the MOD informs the reporter that he should contact them if he wishes to view the film. Mysteriously, in the series of film canisters holding the Blue Streak missile launches, one is missing. The missing canister is the film of the launches for the week beginning Sunday, May 23, 1964. UFOs have been seen in the Burgh Marsh and Carlisle area over the years and it is believed by some investigators and witnesses that the focus of their attention lies in the Chapel Cross Atomic Power Station some 15 miles north-west of Carlisle. Some reports of this matter detail that a subsequent roll of film developed for Jim Templeton had some negatives missing, which he suspects were taken by the government. These reports are unconfirmed. for more than 4 decades nobody came up with a credible explanation for the photograph. Nobody understood how the supposed being on the photograph was invisible to Jim and his family. That the two places on the planet where the figure was reported are the two locations pivotal to the Blue Streak missile programme remained puzzling. The visiting “Men in Black” were never identified. More than four decades later, an explanation was found. First, an image analyst showed that “space man” has everything of a person of normal size and poportions who turned his back to the photographer. Then, others focused on another photo taken that day, showing the little girl and her mother Annie, who was wearing a sleeveless dress of a very light blue color. They found that the “space man” just Annie walking away from her daughter, with some kind of vap and tied hair giving the impression of an astronaut visor. “Secrets Of The Paranormal,” hosted by Jenny Randles BBC2. “Flight trial of F1 – 5th June, 1961,” report by Officer in Scientific Charge H.G.R. Robinson. “Photographer comments on Cumberland spaceman Picture“, article in the Daily Mail newspaper, London, December 13, 2002.